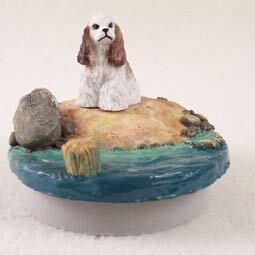 Cocker Spaniel Brown & White Candle Topper Tiny One "A Day on the Beach"
Home > Dogs All > Cocker Spaniel Brn White > Cocker Spaniel Brown & White Candle Topper Tiny One "A Day on the Beach"
Back in the 14th century there are comments made about “Spanyells” which look very much like today’s Cocker Spaniels. The American Cocker Spaniel has been shown in the US since the 1880’s. Cockers are the smallest of the spaniels, and within the Sporting Group where they have been recognized by the AKC since 1878. This breed is highly intelligent, and gentle making them the perfect hunting or family dog. Cocker Spaniels come in three groups of coloring; black, parti-colored, or ASCOB which stands for “any solid color other than black”. Their coats are lush, either straight or wavy, and require regular brushing, grooming, and trimming to avoid mats. Cockers take to water very well, and with the strong sturdy body, can move quite quickly both in the water, and on land.